Do you have all you want? Do you feel happy and fulfilled every moment of the day? Most people don't claim to. But why shouldn't they? Why should we be created to live in a world where we aren't constantly happy? Many people say the answer is this: We are here to learn how to be constantly happy! Now, being happy has been equated to having a "high-frequency spiritual vibration." Unhappiness, correspondingly, is associated with one's spiritual vibration having a lower frequency. The trick to maintaining happiness, then, might be as simple as maintaining a high-frequency spiritual vibration. This meditation is designed to do just that. When one's spiritual vibrations are at their highest frequencies, one's stated desires tend to come true. So, in this step, decide what it is, exactly, your desires are. Remember, phrase your desire in a positive way (desire health, not freedom from disease), and remember not to confuse your goal with some idea of how to acheive it (desire wealth, rather than a winning lottery ticket). Finally, remember that you cannot desire something for someone else. Phrase your desire in present tense, as if you already have it…and you're ready to go! Also known as chakras, these are your personal energy vortexes. Most traditional schools of thought recognize seven centers; but there are twelve. Three of them float above the head! Each center has a name and an underlying Truth. 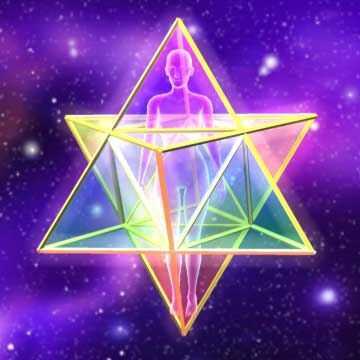 The six uppermost centers have Truths phrased in first person plural, for at those levels the connection with the all-encompasing Divine is most energetic and you speak for all your multi-dimensional Selves, and all the levels of Self. The six lower centers speak their Truths in first person singular, because at these levels the distinction of self from Self is most strong. While you breathe air, your spirit also breathes; it breathes prana, the Divine energy. Breathing prana intentionally increases your spiritual energy, just as taking deep breaths of air before swimming underwater increases the oxygen level in your blood. Air travels through your body on a circular route: Into the nostrils, the lungs, the arterial bloodstream, the veinous bloodstream, back to the lungs, back out the nostrils. Prana takes a more interesting route; for one thing, you can direct its flow intentionally for various purposes. For the purpose of this meditation, you will inhale prana through each center in turn, starting with the topmost, and exhale it through the first, Foundation center. It will take twelve breaths. As you inhale the first, imagine the prana coming in from the twelfth center, about three feet above your head. and mentally state your desire(s) in the form of that center's underlying truth: For example, "We (the various levels of myself) integrate health, wealth, and abundance." Consider what that means—both the "we" part and the "integrate" part. Health, wealth, and abundance (as well as any other desires) exist independently of you. They exist. They are, therefore, not missing or absent. In doing this breath, you are simply granting permission to your twelfth center to integrate these concepts into your life. Next, breathe through your eleventh center, that of Emanation, about two feet above your head. "We serve health, wealth, and abundance." Your desires are concepts; they are things. If they exist apart from you, then not only do you wish them to serve you, you must be willing to sreve them. How does one serve, for example, health? By using it wisely, by respecting it and not taking it for granted. Most important, by allowing it to be present in your body and spirit. The next breath is through the Enlightenment center, number ten, about one foot above your head. "We use health, wealth, and abundance." Having health or whatever you desire present in your life, is pointless if you don't make use of it. Gifts such as health or whatever you desire, are not intended to be hoarded. Hoarding, in fact, blocks energy flows, including that of prana, therefore leading to unhappiness. Next, breath through Perception, located at the crown of the head. "We perceive health, wealth, and abundance" Whatever you desire, already exists; otherwise you couldn't think to desire it. It is already present in your life, whether you perceive it or not. This breath and statement give your Perception center permission to perceive that which you desire. Your next breath is inhaled through Transformation, located within your head, at a point just behind the bridge of your nose (the "third eye" region). "We transform health, wealth, and abundance." Why do you desire this? What will you do with it? If your desire makes you a better person, or helps you achieve your life's goal, then you are transforming it from its original concept to its best conclusion. Bringing your desire into your presence will transform you, too. Sense your next inhalation coming through the front of your throat, the center of Relationship. "We relate health, wealth, and abundance." To what? To your life! To your life's goal, to your goal as an immortal entity, to your experience. You next inhale through your heart, the Centeredness center just behind the breastbone. "I know health, wealth, and abundance." Allow yourself to know your desire, the concept. Picture its color, its shape, its texture. Hold it close to your heart and let it warm you and fill you. The solar plexus, at the bottom center of your rib cage, is the Aspiration center. This is where your intentions live; so when you say, "I will health, wealth, and abundance," you are stating your intention to have this for yourself. The Connection center is also your center, just behind your belly button. "I feel health, wealth, and abundance." Allow yourself to do so. How does it feel to have your desire present in your life, right now? Your next inhalation enters through your groin, the Mobility center. "I think health, wealth, and abundance." When you make decisions, make them as if your desire was present in your life. That's what allows the space for your desire to manifest; if you plan for illness, why should you have health? The center of Acknowledgement is located at the knees; inhale through there as you say, "I have health, wealth, and abundance." Allow yourself to feel satisfaction at the having of your desire. Finally, the Foundation center is at your feet, where you've been exhaling. Inhale there and say, "I am health, wealth, and abundance," as you exhale. This statement gives you permission to personify your desire. If you wish to continue this meditation, you may do so by repeating step three, while adding a visualization. You may wish to practice step three a few times, first. In this visualization, picture yourself as residing inside two tetrahedrons. A tetrahedron is simply a three-sided pyramid, one in which all three sides and the base are equilateral triangles. As it happens, your upper body can fit entire within a tetrahedron if the point is placed at your Integration center (three feet above your head) and the base bisects your Acknowledgement center (at about your knees). If you are male, imagine this tetrahedron positioned so that a corner and point are directly in front of you; if female, so that the corner and point are behind you. That is, the female's top triangle has its point in back, the front has a flat side. The downward triangle has the point forward and the flat side with two points in back. The arrangement for males is the opposite. As you inhale, imagine this upper tetrahedron glowing with white light. When you've grown practiced at this visualization, add a second tetrahedron to it: The point is below you, the base comes as high as your solar plexus, and the point is opposite the upper tetrahedron's. Fill it with white light as you exhale. Once you've mastered visualizing both tetrahedrons, you may try the final step: Spinning the tetrahedrons. You may try spinning them together, or in opposite directions; you can spin them clockwise or counter-clockwise. See how each feels. To finish the meditation, take a final, deep, cleansing breath and thank God, All That Is, and/or yourself, for the opportunity of doing it.